In December, I happened to read this book called “Making Ideas Happen” by Scott Belsky, and it had this rather cute little concept (okay, not really little) that sort of said that the worst enemy of a good idea is another good idea. I don’t remember the exact words, but I do remember my aha! feeling at reading that, because that sort of thing happens to me and around me all the time. Take my attempt at blogging yesterday. I opened my blog-ideas folder, saw lots of them. I flipped through them, started typing. Barely a couple of sentences down I stopped; the idea required effort to get converted into a blog entry, some pondering, some research, some gathering information and opinions from others. Okay, that was hard work. The shine of the idea dulled because of the work it entailed. So I picked up another idea that seemed simpler. A few sentences down, I paused. You can guess what happened. And it happened a few more times before I decided to stop. I have plenty of thoughts about plenty of things. Mine is the typical monkey mind 🙂 There are many things I want to try out, to do, to share. And definitely I cannot do all of them; I have to prioritize…Ideas come in all shapes and sizes, they come as a windfall, they come all the time. Some are big ideas, will take a lot of work, but are also a gamble. Some are small but easy to do. Most are in-between in their just-popped-in-the-head state, and could go either way if pursued. I also have lots of ideas on prioritization criteria (but I am unable to select from them, too). Back to Belsky, and his concept; I think he’s got a point. I keep reading/ hearing announcements of ideas that people have started work on. Ribbons are cut, speeches made, projects launched. Then comes the next big idea, and the previous one seems less shiny. Work on the first idea is slowed down, resources withdrawn, diverted to the next, bigger, shinier idea (till an even shinier idea comes along). So yeah, at least one of the things that stops a good idea from happening is the coming along of another good, or maybe even a great idea. Last year, around August end, I started getting an idea that seemed big (and frightening). I skirted around it, played with it, shelved it, and so on, and then finally in January this year, in the middle of my blogfest, I started work on it. Now the idea is at its most boring phase, the phase where it is lots of work and a gamble, and every day, as more totally different, fresh and sparkly ideas pop up in my monkey mind, I am tempted to say, okay, let me deviate for a few days. Aww, let me confess, I did get diverted at least thrice in these last three weeks for non-trivial and good “other” ideas. Then I pulled myself back to that stodgy idea I had told myself I’d pursue. Anyway, so when it came to writing a blog entry, I was tempted to start a couple of small blog-entry projects like the one I had done in December. Nice, new sparkly stuff. I have two topics on which I am raring to go, to gather data, to mull and think and structure. That’s probably one of my shortest blog entries, which should be a relief to those readers who ended January as weary reading my blog entries as I was writing them. Oh boy, what a relief! Making 31 entries in 31 days is an endurance test, and as it is the only target I set in the year, I am so glad it’s over. It’s not that I will be couch-potatoing the rest of the year, but the January blogfest is the only activity where I aim at time boundaries as such; the rest of the year I just keep going at whatever pace I can manage, for whatever work I want to do. When this year, on January 1, I kicked off this year’s blogfest, I had been very shaky about it, but all in all, though there were days I found the writing tough, I am glad I took on this job. Because, you see, like in previous years, it has helped me notice things. The sheer intensity of a daily blog means one has to think harder, search more inside. My concern about caregiver role recognition and support remains a major one for me, and that I am also very concerned about caregivers being able to pool their knowledge and tips and be a continuing community even though individual caregivers may move on and away when their loved one passes away. I have thoughts and ideas and wishlists that I want to share with concerned persons, and while I have been communicating these whenever I met someone who seemed interested, and while I have also been blogging about it, I have not been clear and systematic about it. I have created some resources that could be useful to others, but I need to find ways to make them easily available to anyone who may benefit: I am adding this to my to-do list. I discovered that I am getting increasingly concerned about ageing and eldercare in general, especially on how well the problems are understood and how well support is available to those who are not on the gung-ho positive side of the ageing curve. I see this as important because dementia care that fits in this context, but I am also concerned because I and many people I know will need such support in some years. I feel not enough is happening in this area in tangible ways, and not enough resources are available. (This is not yet an area I plan to do anything in, except share random thoughts). And finally, I reconfirmed that blogging continues to help me sort my ideas, meet people, share concerns and ideas, and even act as a journal for work-in-progress. So I’ll be blogging more this year, of course, possibly managing a weekly blog norm, but that’s more like sticking to a habit than hammering myself for a target. For today, I declare the January 2012 blogfest closed and I’m off for some celebratory chocolate. I’ve always been uncomfortable with dogs (read: scared of dogs). My first clear memory about dogs is of when I was around six years old, a diminutive and timid kid, and a huge Alsatian dog chased me across a lawn (we were visiting the dog-lovers). I clocked my best life-time sprinting speed that day while various parents laughed like it was the joke of the century. Then, once the daughter of the house had caught the dog, I was scolded for running and making the dog think I was playing a game. I dare say if a beast taller than them had drooled over them and displayed sharp teeth, they would have thought differently. In the years that followed, I learnt to avoid dogs and also to act nonchalant. I even laughed when others looked scared, and would manage to look charmed and pat an allegedly cute dog. I had realized by then that people who knew you were scared of dogs took it as their sacred duty to bring dogs closer to you to help you get over such irrational behavior and “prove” that dogs are cute, so I was safer if I hid my fear. So yeah, there are no-TV days that get a lot of fanfare, but here’s the thing: most people just cannot imagine that there are real people out there, people they know, who don’t even have a cable TV connection. I’m one, and I always get totally incredulous reactions when someone says, “Watch this program,” and proceeds to give me a channel name and time and all that, and I say, I don’t have a TV connection, so sorry, I won’t be able to watch the program. “I don’t watch TV,” I say. 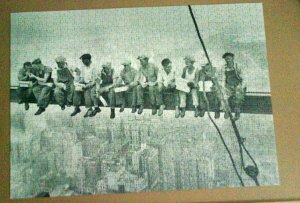 Perhaps appropriate to a week when most of my posts have been about ageing, I was using my free time to work on the jigsaw alongside. …and they all look so different depending on the color of the adjacent piece. Day 21, and I am well into this month’s blogfest, past the 60% mark, which (in my student days) was the cut-off for “first class”. Which makes me a “first-class blogger”, in a manner of speaking. Given that I was reluctant about this year’s blogfest, it is a relief that I have managed to blog every day so far. It has not always been easy, but it has also not been as tough as I had feared. Blogging is, for me, a strange medium, both intensely private and openly public. One some days when I sit down to blog, I am in a small little world of my own, just writing to sort out my thoughts and emotions. On those days, even though I know I am blogging, I forget that others may read what I write. On the sadder days, each word draws out with it a droplet of my blood, or so it seems. It is so private. It is only when I am about to click “publish” that better sense prevails and I go back and try to clean out things that are just too private or could be intrusive for others. I must admit that part of my week’s obsession with ageing problems and support is that in the month of December I was called a senior citizen twice. I am a number of years short of that landmark, and the comment made me bristle, not just because it bumped up my age (something which even an elder-respecting society does not consider a compliment) but also because of the attitude with which those words were said…sort of, all is over for you, Ma’am, and so anything you do is unexpected and like a miracle. It was so dismissive and patronizing that it bugged me. It made me wonder how I’d feel once I did cross the age of 60 and heard the word applied to me in that tone, knowing that the appellation was factually correct. Anyway, why should a particular age matter so much, and why should it be such a way of judging people? Are the Govt concessions connected with the age worth that aura? I have, of course, only myself to blame for being taken as a senior citizen before I have reached that “silver” age threshold. For one, I am not dead. If I had died when younger, I would have died wrinkle-free and black-haired, without having the word “senior” applied to me. But, you know, I would rather be alive and senior, than dead and young. When I was sixteen years old, I got admission in an engineering college and ended up joining a class where I was the only female. This was back when people did not even know that women were “allowed” to become engineers, and just about everybody who talked to me about it was critical about my “wasting” a seat that a boy could have taken and become an engineer (all except fellow female batch-mates and my parents and a few of their very close friends). Relatives told me the course would be too tough. One cousin who was studying engineering told me that I would never be able to do “workshop”. And just about everyone told me I was wasting a seat, I was wasting the nation’s money, the taxpayer’s money, because after all I was a woman and I would never take up a job, and even if I could, I would leave it for my “family” later, and for bringing up my kids. I was told again and again that I should quit the seat so that a “deserving” boy could become an engineer instead. In my class I encountered two species of classmates; one, the silent ones who never said anything, so I never knew whether they were hostile about me or just cowed down by the second species, and two, the hostile ones who reminded me that being a female I was incompetent and also wasting a seat. Now I can use this post to write about many things that have happened since. I could write about how many of my engineer classmates went on to sell soap and colas or read balance sheets in banks, careers which possibly don’t need knowledge of Fourier Transforms or resistor color codes. Or I could point out that many chose to be part of the “brain drain” in the days when leaving the country was considered unpatriotic (but of course, now pravasi bharatiyas welcomed back open-armed, because times do change, and society does become more mature and open). Then again, amusingly, some ex-classmates are sending their daughters to IIT coaching classes, and I doubt if they remember how hostile they were towards the female engineers when they were students. Hey, I could even write about how unfair it felt at “sweet” sixteen to be viewed as a potential housewife (housewives became “homemakers” decades later) and a potential mother and not as someone able to contribute using the brain. It also induced suffocation about my future. But strangely, it is another angle that strikes me when I look anew at the past. What strikes me now is that, in all those comments about how I would give up my job when I had a child to bring up, people were clearly recognizing child-rearing as a task that needs intense work and attention. But no one talked that way about the intense work and attention that goes into tending to humans at the other end of the life curve. No one ever told me, for example, that I would be wasting national taxpayer money when I quit my job to tend my parents. No one said, you will end up doing so when you are at the peak of your career, young enough to be productive, yet experienced enough to really add value to the field you are in, so everything everyone has invested in you will go waste. No one recognized the elder care work, the role, the criticality of the role. Again and again, I am puzzled at how a society that prides itself on its respect for elders and the need for families to rally for their care does not register that if such care has to be given, it has to be planned for, factored into life choices, and so on. Over these last two decades, I have begun suspecting that most people don’t know how to interact with peers who are unwell and disabled; they mess it up, their discomfort/ disapproval is obvious, and then they go away blaming the unwell/ disabled person implying that they would have coped better with the situation when in fact they were unable to cope with even ten minutes of an interaction. I have encountered this several times in the past few years, and I dare say, there were instances before that, too, but I was not clued in enough to notice them or feel a dissonance. One aspect of this is creation of mental and social narratives and even fictional depictions. That is, how people form the story around the person and family in their mind and in the way they may talk about it to others or even include it in their fiction. So a powerful novel may show how bad the daughter-in-law was to her ageing and frail mother-in-law, and if this novel gets traction, if it gets the readership and critical acclaim the author wants it to get–what will be the impact on daughter-in-laws who are struggling to do their best in far less black-and-white situations with far more complex aspects to balance? And if the novel is based–loosely or in a thinly disguised way–on people around the writer, what will the social impact be for these unwitting fodder for the novelist’s writing project? Those are real persons out there, not cardboard tropes. Soap operas and films, of course, end up doing this type of thing just too often, but I’ve seen similar problems in novels that have been critically lauded and have won awards. 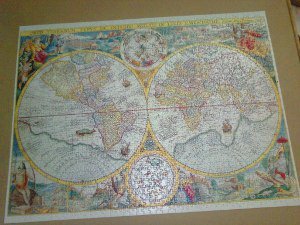 My knowledge of world geography has always been abysmal, so when I saw this 1500 pc jigsaw some months ago I knew I needed education. So what if it was an old world map with astrological signs and names written in Latin and all sorts of interesting pictures? Hey, those pictures are what fascinated me. After a number of engrossing hours of world-building of the jigsaw type, my geographical knowledge was no better though I had the full picture constructed. I had remained too lost in the individual shapes and colors and missed the world for it. But hey, that’s what world leaders do all the time, so I guess I’m in elite company. I’m somewhat wary of self-proclaimed optimists because of their negative views about people they consider pessimists. Now don’t get me wrong, I am not talking of people who have a positive energy and view with regards to life, though they are optimists, too; I am talking of people who keep insisting that they see the glass half-full and are always happy, and who assume that anyone not claiming to be an all-bubbly optimistic is a pessimist. I am talking, possibly, of all those well-built aunts who smacked my back jovially, all 80-kilos force in their cheerful gesture, and told me, “Be Happy!” while I tried not to groan as I twisted myself back into shape. I have often wondered why optimists cannot see the glass half-full when viewing persons they consider pessimists. Centuries ago (okay, around fourteen years ago), after my father’s death, my mother was convinced that my sole task in life should now be keeping her happy. She wanted company. All the time. She would allow me toilet and meal breaks and meal-cooking breaks, and I could take off time when she was resting, but if I dared say I had to go out for work, I’d be subjected to a lecture on duty towards her, and on my greed to want to work. This was back when no neurologist we consulted had bothered to tell us about dementia or even cognitive decline, though my mother had complained to them about memory loss. We had no idea that she was having problems staying oriented and in understanding things, let alone changing her way of thinking. We have no idea that she probably wanted familiar faces around her all the time because of those (unstated) problems. Possibily because she grew up in a rather well-to-do family, my mother had always believed that anyone who worked for money was greedy. That people who worked in jobs did so only for money, which was a filthy thing to do. She had a phrase she often used to express the “greed” of persons who worked hard in paying jobs: निन्यानबे का फेर (ninyaanbe ka pher, OR, the trap of ninety-nine). It’s an interesting concept. Basically, someone who has 99 rupees will want to earn one more rupee to make it a round 100, and that wanting a bit more to round it off neatly will keep the person on the grind. A bit like Tolstoy’s How much land does a man need. After my father’s death, my mother began commenting on my being in the निन्यानबे का फेर trap very frequently. Apparently all it takes is a can of black paint, a broad brush, a wall, and some imagination. 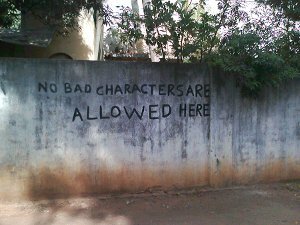 I just hope the forbidden are literate enough to read this, and compliant enough to, well, comply.